Consider the work of the best game designers. Gary Gygax’s part in developing role playing games certainly stands out. Steve Jackson’s microgame designs such as Ogre, Car Wars and Illuminati are similarly influential. Steve Cole’s space gaming masterpiece, Star Fleet Battles, has been in print since the seventies and is still being developed. And even before designing the first card-driven wargame, Mark Herman had already left an indelible mark on the hobby. If you ever wanted to understand how exactly these giants of gaming produced their works, you can now learn how with this book. Though the the author isn’t a household name outside of game conventions and role playing circles, he has in fact created work that is on par with the best games ever made. But don’t take my word for it. Listen to prolific block wargame designer Tom Dalgliesh who singled out Lewis Pulsipher’s Britannia for the book Hobby Games: The 100 Best. “Every game has the same events, yet every game is different. And one of the great appeals of Britannia is that you are never eliminated from play. Each period brings you another nation to direct and the final outcome is often in doubt until the very end.” As a four hour tabletop game covering hundreds of years of British history, it’s not hard to imagine Avalon Hill rejecting it as they initially did. Its premise seems impossible… but it works. It is an engrossing game that has maintained a devout following since its release in 1986. Given that there are no signs of Britannia’s appeal dissipating, Lewis Pulsipher is well on his way to meeting Volko Ruhnke’s definition for immortality. You wouldn’t know it by looking at him. He stands at about six and half feet tall and (though he doesn’t look it) is over 300 pounds. Between his glasses, his mustache, and his wearing a cap to cover up his baldness, he looks about like you’d expect someone to look that has a Ph.D. in military history. (He got his from Duke University in 1981.) If you see him at a convention, you won’t see him playing games, though. Kibitzing with designers and publishers, getting his stuff playtested, and giving talks on game design is how he spends his time. He is extremely approachable. If you press him, he’ll gladly explain to you why your favorite game isn’t that great. However, he’s far more likely to want to pick your brain about why you like it. This is because he makes his games not for himself but for a variety of audiences with different tastes. He’s keen on getting inside the heads of dedicated hobbyists even if they see things differently from him. 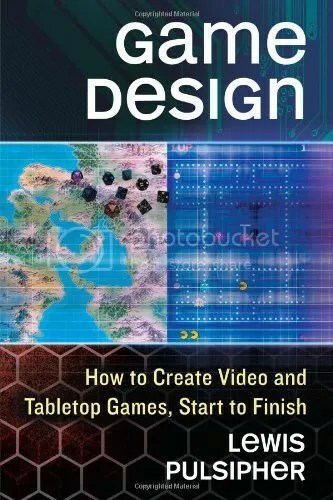 If you are just looking for a good read, then Lewis Pulispher’s book will take you behind the scenes and show you exactly what goes on in the game design process. I’ve read countless designer note articles, read a half dozen books about game design, and poured over dozens of gaming blogs. Though I see a lot of the same overall tips and principles recurring here and there, I haven’t seen anyone give as comprehensive of a treatment of this topic as what is in this book. Even if you don’t intend to design games yourself, it can really open your eyes to what motivates differing types of gamers both at the tabletop and in front of the computer screen. It’s especially enlightening to see what underlies your own biases, particularly if you have strong opinions about gaming. The true value of the book will of course be had by aspiring game designers. Playing games and writing about them was my primary hobby for ten years and I was stunned to find out just how little I knew about actual design. All those hours spent tinkering with games gave me a notion of the possibilities. And sure, I had ideas… but I knew nothing about the actual process of design. It wasn’t long after I began to apply what was in the book that it became clear why it was I had never succeeded in designing a game of my own. You see, on several odd occasions over the years I had attempted to make computer games. A minor byproduct of my struggles was that I managed to get enough skills to land jobs as a computer programmer, but I never did end up with a working game. There are just so many pitfalls! The novice will tend to want to do all the wrong things and will only do the right things by accident. That’s how it went with me, anyway. But game design is more than just doing a few right things. You have to get several different ideas going at once because you don’t know at what point any of them will be revealed to be unworkable. It’s not always possible to frame your ideas into a working prototype. If you do get something moderately playable, it’s not always clear just what you need to do to turn it into a good game– if it is indeed possible to do that. Once you leave the brainstorming phase, game design rapidly evolves into raw problem solving. Because of this, people have a tendency to work on any aspect of a game except the actual design: it’s that grueling! Fortunately, Lewis Pulsipher has described each phase of the the design process in such a way that he can save you countless false starts and make you productive almost immediately. People that are familiar only with video games will struggle with the amount of material in the book covering the tabletop side of the hobby. But tabletop games do not require any special technical skills to create and do not require teams of programmers and artists to make them work. Tabletop games have no hidden parts, no black boxes, and can have their rules changed even in the course of play. That last feature is critical. It means that you can rapidly iterate through successive ideas and combinations of ideas so that you actually have a chance of developing a good, playable design. Insert hours of programming between each of those steps and you are unlikely to get anywhere if you don’t already know what you’re doing. Back when I attempted to implement my own computer games without the benefit of a book like this, I ended up getting things that looked sort of like games, but for which no real design work was done. Even after fumbling along for weeks on end, I’d failed to realize that I hadn’t solved any of the essential problems implied by my ideas. If you want to have something to show for your early game design efforts, you would do well to avoid programming and art related aspects for as long as you can. Choose tightly scoped, completable goals… and start finishing games. Read Lewis Pulsipher’s book for a smorgasbord of options and tips that can make you more effective at every stage of the process. There is no better resource that focuses on design in this level of detail. If you look back in the history of this blog, you can see that while I was able to create a proof of concept for a game design last year, I showed little interest in developing the idea any further: I never followed up on it. After taking Lewis Pulsipher’s course, I took a more modest game idea and developed it to the point where a playtester actually asked to play it again. (This post has links to everything related to that first project and the other exercises for the class.) After that, I tried my hand at a variety of smaller projects with an eye towards producing complete games. When I couldn’t think of how to complete my first adventure fragment, I created a set of “old school” dice tables to sketch out the rest of it. That wasn’t quite a completed game design, but I was heading that direction with something that was at least a fanzine level of accomplishment; my subconscious was better informed about things that could potentially paint me into a corner. My next move was to go back to my old notebooks and completed a character generation idea that was half finished just so I could have something that was done. After that, I worked out enough stuff for an original adventure design (detailed here, here, and here) that I am ready to take it a con and run it with a group of random players with only a few minor changes. With multiple projects in a working/usable state, I can afford to be a little more choosy with regards to which ones I go back and perfect, hone, and polish. This is a very exciting position to be in– so much better than wasting years plodding around with something that’s never going to amount to anything. While a lot of people have criticized him for destroying kids’ dreams, I would argue that in spite of his no-nonsense curmudgeonliness, he really does equip you so that you can make your game design dreams a reality. But setting your sights on things that you can reasonably accomplish early on is going to be hard for the sort of people that want to skip the work and go directly to being a superstar. I can tell you from experience, though, that it is far more satisfying to get well into the process of developing a modest portfolio than it is to sit around daydreaming about being the next Reiner Knizia. It’s true, you can make more money for your time by picking up cans on the side of the road, but there’s nothing like seeing people laughing and having a good time and begging to play something that you designed. It’s work… and the design process is often tedious and frustrating. But I can see now why it is the Lewis Pulsipher says that his favorite game is the game of designing games. With his book, you can find out for yourself how well you like it in a matter of months. It won’t be painless, but your chance of getting results will be far stronger than if you attempt to strike out on your own without the benefit of this kind of direction. Thank you for the kind words about one of my oldest and dearest friends. Lew Pulsipher. He is oddly unsung as a gaming guru despite his incredible impact on board games, computer games, and D&D. We recently had Lew over for a long weekend where we play tested a bunch of his new games and he DM’ed for us. I joined his campaign in 1986! All 1e, and amazingly good. He said that when he ran for my family it was his first DM session in years, but we hope to get that frequency up. He has 6-7 unique classes, dozens of unique monsters, etc. Of course, he was an editor for Dragon, White Dwarf, and Space Gamer at the same time, so…. If you ever get a chance to play *with* him, take it.